This fall I’m taking the easy way out and decorating for the season with what I have on hand. There will be no scarecrows, or spiderwebs or lots of heavy, real pumpkins or FUSS! This year I’m using what I have and gently incorporating fall into my decor, not the other way around! I want my annual nod to fall to be just noticeable… not overdone. This really takes the pressure off! If it’s too messy, glaring, bright, heavy, time consuming or I have to buy it… forget it! Let’s join together and celebrate a kinder, gentler fall? 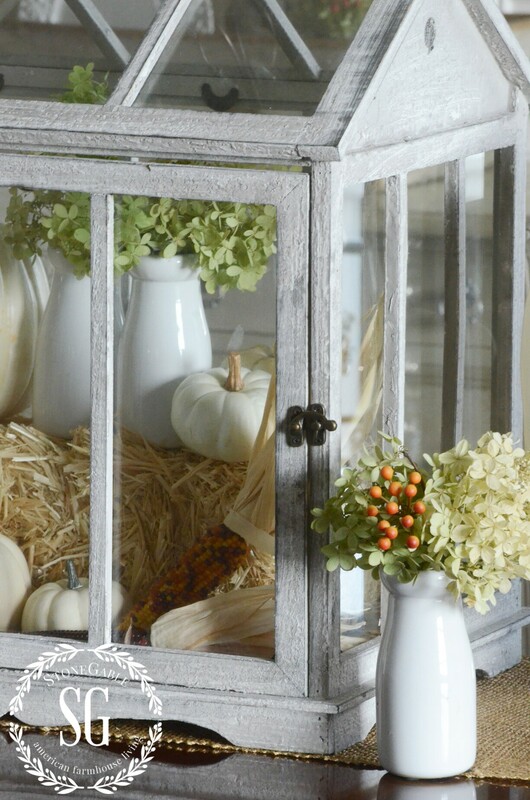 The star of this fall dining room is the window greenhouse filled with fall bounty! The small hay bale and Indian corn and faux pumpkins have been used over and over again for years!!! I filled sweet little white milk bottles with Pee Gee hydrangeas from my backyard. Here’s a little tip: I put my hay and Indian corn in small plastic containers, like those plastic shoeboxes, and they will last from year to year! We don’t have to buy it new every year!!!! Just remember to use plastic so mice don’t get into it! Make sure it is sealed tightly! Don’t you love the contrast of rustic and luxury decor together? I sure do!!! A simple burlap cloth runs the length of my formal dining room table! 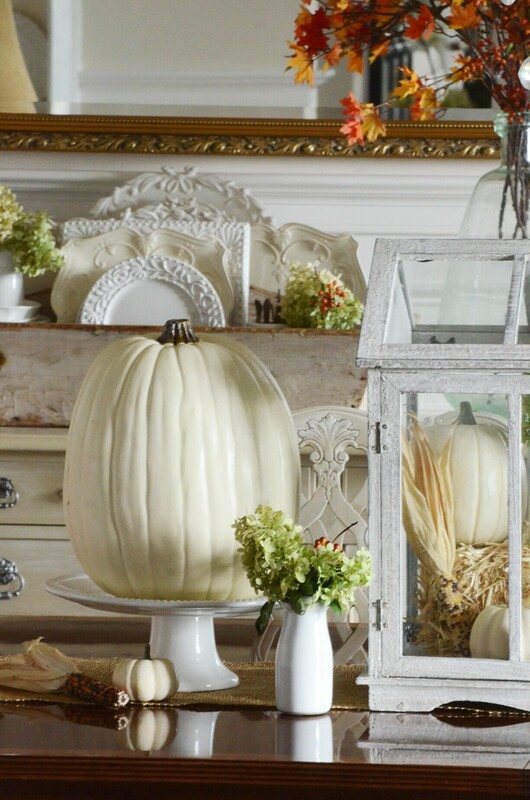 Two big faux, yes… faux… white pumpkins are perched on white cake plates. When it comes to pumpkins I am all about fake ones for indoor use!! They are so so much lighter than the real deal… and last longer too! Now all I need to find are some great Cinderella pumpkins that are faux! Aren’t these little milk bottles adorable!!! The hydrangeas will dry just as they are in them! If you’ve been reading StoneGable for awhile, you will know my love love love of pillows! I’ve had these big euro shams for years! They match a big duvet that I used on one of my guest room beds. Who says euro shams can’t be used downstairs? The burnt coral color was soft enough to work with the rest of the dining room! And the background is almost the same color as the wing chairs! I’m all for easy-peasy decorating this year… how about you? 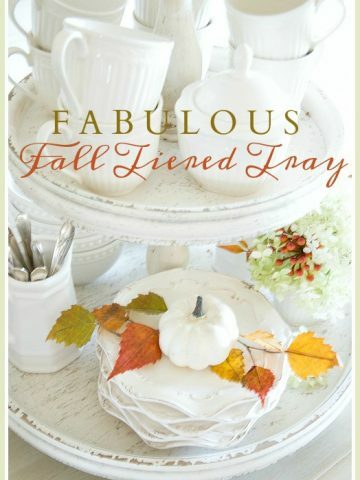 What fall elements do you have on hand that you can ease into your already there decor? You might want to pin this to your fall or decor Pintest board. Follow me on Pinterest HERE. Love the simplicity and elegant chic style. I am currently on the hunt for a greenhouse to use in my home decor. I did the same this year. I only used what I had and decorated the mantle with it all. It’s crowded, but it looks perfect to me. Thanks for inspiring me. May you please share the paint colors in your beautiful dining room? I think I found that the walls are BM Sonnet? I would like to know what color(s) the ceiling is as well. Our ceiling is a flat white ceiling paint. Hope this helps! I love the glass & wood piece that is in the middle of the table. Where can I buy one? I have always done a small bit of fall decorating – trying to give a nod to the beauty of the season without all the Halloween craziness the stores try to have us buy every year. My three children have always asked if we could add more”creepy” and less “pretty”, but I have resisted. This year, I did a witch door hanging craft as my nod to their request for spooky stuff. That’s it though. I love your table-scape and your dining room decor. It was such a great idea to use the Euro pillows on the chairs. It adds just the right amount of soft color. Yvonne, I just HAVE to tell you how much I’m enjoying your blog!!! I just discovered you through Thistlewood Farm and I look forward to receiving your emails at work each morning. The only problem is that I want to go home immediately and try out your latest project. Keep up the awesome work! Hi Judy!!! Welcome to the StoneGable family! As always I so enjoy visiting Stone Gable! Soooo, beautiful! And I totally agree….a softer, lighter fall décor this year is the way to go…I’m taking your advise especially since we just finished painting the entire house! I can sigh now! Hi Julie, My post goes live tomorrow. We are featuring 3 a day! I hope you will come back and visit me tomorrow! Hi, Yvonne! I’m spending part of this day pulling out autumn decor, and I’m totally on board with your notion of celebrating a “kinder, gentler fall.” I don’t want to have to spend another dime! When I look at the multiple crates (one storage room is devoted completely to fall/Halloween items! ), I know it’s time to slow way down. In fact, I’m picking through and deciding what can go to my Mom’s church rummage sale. I figure I can just buy something new if I regret having given stuff away later! I love how you’ve tipped your hat to fall without totally tipping your hand. Beautiful! And so far the faux pumpkins, etc. is concerned, I’m with you all the way! As long as they look great, why not? Raising a glass to you! Oh Yvonne – everything looks just stunning – magazine worthy !!! So so pretty! Coming back by again to share!! 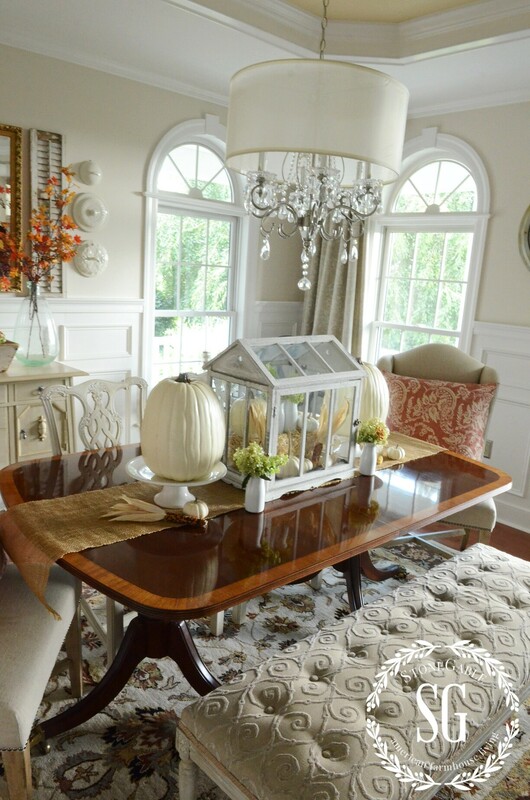 Thanks Yvonne for your beautiful fall decorating inspiration. I appreciated the tip on storing last year’s decor in a plastic box. Last year, I discovered a plastic pumpkin that mice had chewed in my attic. They had chewed the stem completely off and left a hole in the top. I cut out a bigger hollow area and made it into a container for a floral arrangement. I totally agree that we should try to reuse what we have as much as possible. Hi Yvonne! As usual, just a gorgeous room! 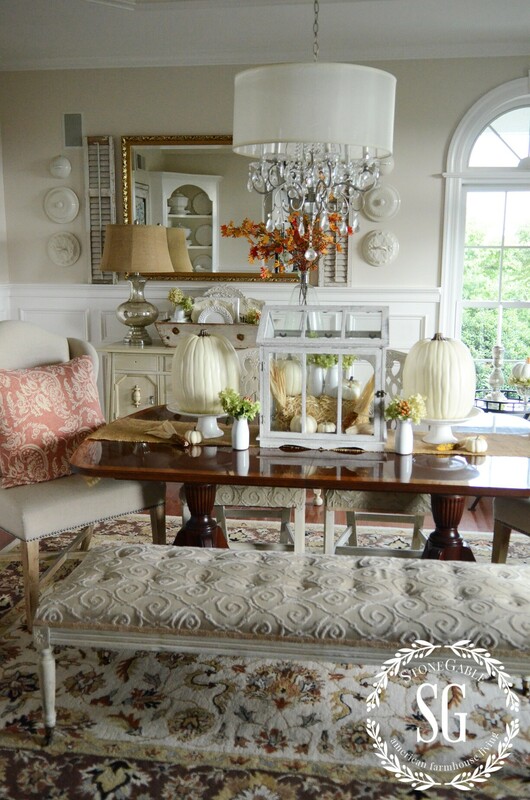 I love the coral and cream pillows in the chairs…a soft nod to a Fall color. Thanks for sharing this wonderful room with us. I have seen the greenhouse used in a number of your vignettes in the living room and dining room. Could you share the source? Hi Angela, I found my greenhouse at HomeGoods. I adore your lighter~softer side~ in your dining room decor! The burlap is a great textural contrast to all the glass, ironstone and wood tones. I, too, adore pillows in a n y chair!! !The subtle coral is an amazing contrast. Thank you, for gently reminding us to use what we already have in our home decor. 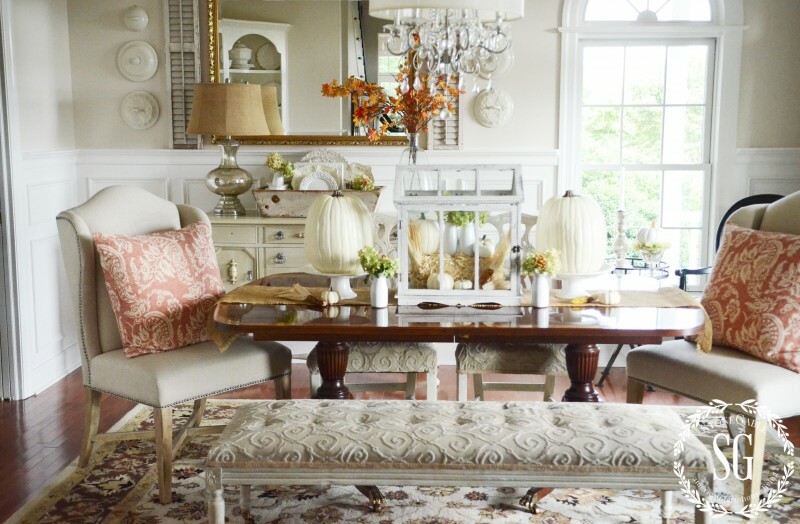 Here’s wishing you cooler September temperatures to go with your softer side dining room palette! I agree. Can we have a kinder and gentler Christmas, too?????? I’m just in love with your dining room. Love all the natural colors and texture. While I love the little greenhouse, I can’t help but notice the white box on your buffet filled with your beautiful white dishes and hydrangeas. LOVE it! I absolutely love all the white with just a touch of orange. Super pretty. Absolutely gorgeous, Yvonne. It is a truly fresh and lovely nod to autumn. I too have been moving toward a softer size of décor over the last few years. More natural… less bright and invasive. Luv, luv your table scape! First let me say what a wonderful new blog home and stunning new look Yvonne, But your old blogger blog was stunning too! Everything you do is stunning! Love the white pumpkins and will be incorporating them into my fall decor this year. Thank you for sharing all the wonderful tips and your beautiful home. Reading the comments, I agree about the softer side of Fall. My goal this Fall is to fine a few faux boo pumpkins to incorporate in my Autumn decor. Love your decorations! I have one of the small greenhouses also, forgot about it untill i saw yours…need to go get mine now!! 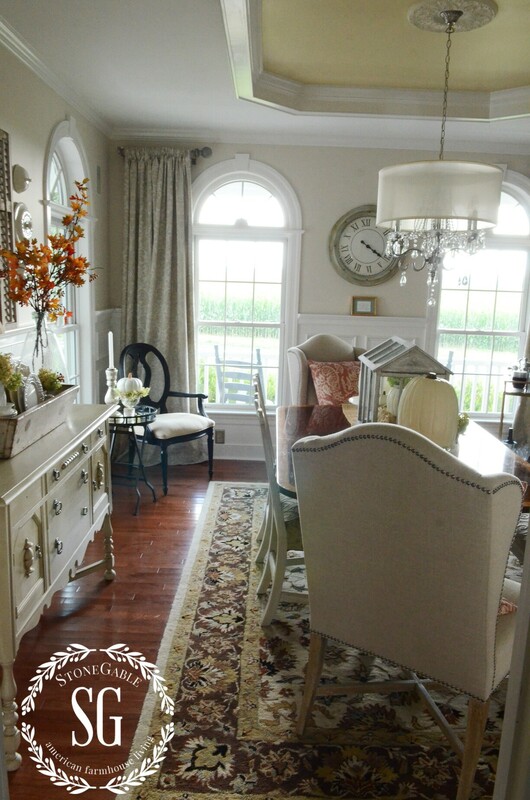 I love that you showed different angles of your beautiful dining room! I adore those coral hued pillow and all the texture and pattern going on! Thanks for inspiring me with every post! Yvonne, love your dining room. Have you shared your source for the chandelier? I am so glad that I happened upon your beautiful blog! Your home is stunning, the colors you’ve chosen are so calming and peaceful. Your blog posts, plus a good cup of strong coffee, inspire me to dig stuff out of my basement ‘stash’ and start decorating for each season! Love that Barb! Just what I want to do!!!! Love the white pumpkins. Do you buy them already white? Where do you buy them? This room is so beautiful and you always have it decorated to perfection. Love it all. Yvonne, I never know which room in your house is my favorite! Your version of fall is perfection! I adore the soft shades of white. Right back at you Laura!!! Simple. Elegant. Beautiful. That’s it! I love the white pumpkins, they make such a simple statement. I’m all about using faux pumpkins down here in Texas. It’s still way too warm even through much of October to try to display real ones, as they will rot too quickly. 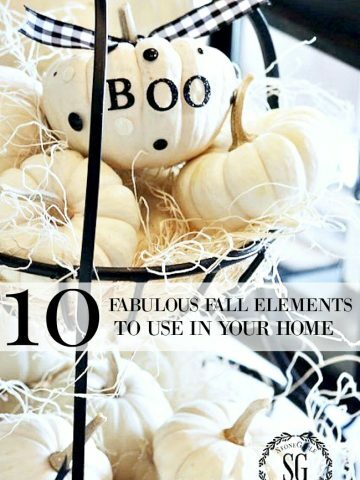 I like to use the faux ones year after year, although I do enjoy incorporating a few real mini pumpkins and gourds into my décor. Love the idea of how to save Indian corn and haystacks! That’s a great tip! Thanks! Yvonne, I always fall in love with all your ideas and I have always love that “rustic-lux” look., which is so big right now. Last year I found a burlap runner that had a subtle gold thread running through it. Now you have imspired me to drag it out and get started. Do you get your faux white pumpkins anyplace special.? Where I go, they don’t look as nice as yours, unless they just photograph well. I’ve always admired your white greenhouse (is that an oxymoron)? One of these days I must find one, because it is so versitile for decorating just as you have display in different areas of your home. Love this softer side of Fall. I think I’ll add touches this year and not overdo! 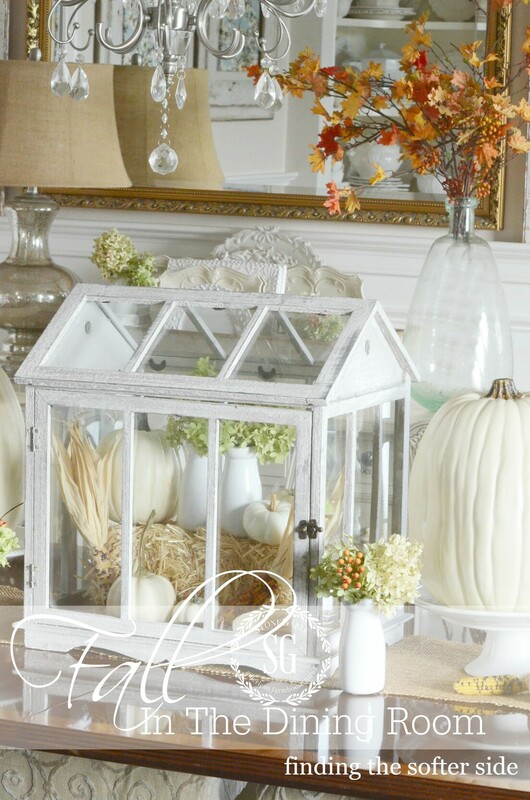 Love those white pumpkins and I might add something like that to my decor this year. I just love those little white milk bottles. Could you please tell me where I could find them? I am l loving the softer side of Fall with just a punch of the brilliant orange…..I also love that you placed that cute greenhouse on the dining room table….the unexpected is always a great thing!……gorgeous tablescape Yvonne! !…Have a wonderful weekend!!! Thanks for all the great ideas, Yvonne! The older I become the softer and more peaceful I want my décor and your ideas are perfect! I want to honor Fall, my favorite time of year, not necessarily Halloween. Time to get out my pretty white cake stand and put it to good use! Enjoy your fall, Yvonne! Thank you for continuing to inspire all of us and making my day! PS I too, love your bench!! It’s GORGEOUS! Do you have more info on that on your blog? Is it an old piano bench repurposed? THX!!!! I love the white pumpkins and your little edwardian greenhouse is so cute. I saw some silver pumpkins at Home Goods recently and might mix white and silver pumpkins for my table. Beautiful inspiring table, Yvonne! Beautiful. Iam in love with your White Fall.. I have previous fall décor like leaves, pinecones, burlap, etc. But for this year I want the White Fall like you. I was hunting yesterday and Iam very happy because I found the white pumpkins and two 8 inches mercury glass acorns on sale that makes me crazy. Seven dollars each.. They are beautiful.. Iam very anxious to prepare my fall decorations around the house. But I have to wait until October or the end of September because I live in Puerto Rico. It is not common to see fall decoration right now.. Thanks for your ideas. Have a nice weekend. 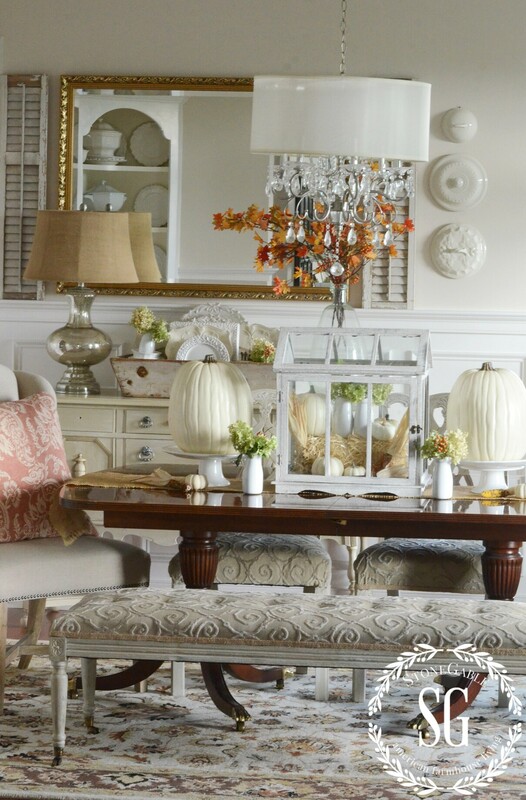 I’m with you Yvonne~fall can get too heavy very quickly~ your dining room looks just right with the white pumpkins and pale orange pillows. I love your plate stack in the old crate on your sideboard, very stunning! 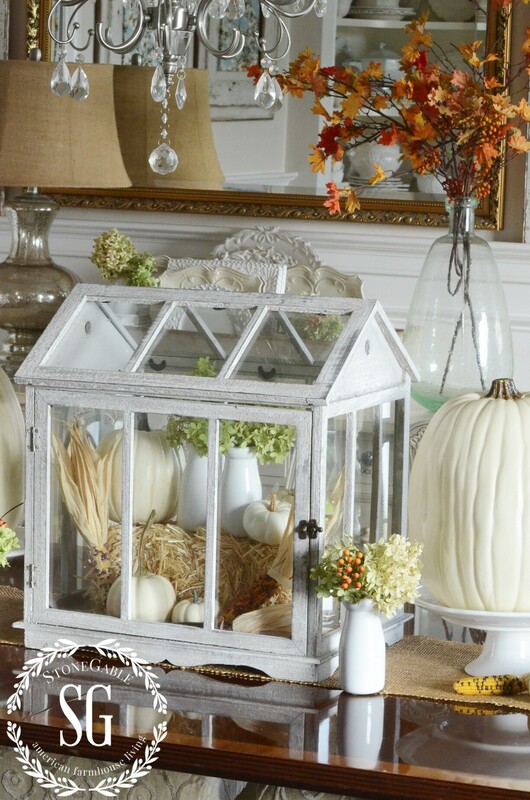 Love those white pumpkins…that is something I have not tried..and the burlap runner is a great addition. My favorite piece in your dining room? Still the recovered bench! The fabric is so eye-catching! We don’r decorate for fall like you do in America. Although if I did I really don’t like the bright colours and cob web things. I would do it just like you…. if I could. 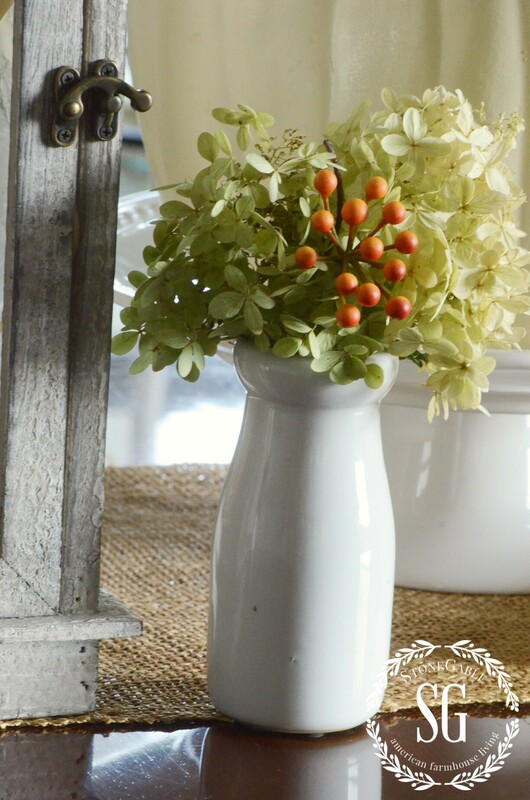 BEAUTIFUL neutral decor for the season! Less is ALWAYS more and you did a great job. Lovin’ the white! This is beautiful Yvonne! I am all for easy peasy and inexpensive. The closer it gets to Halloween I’ll put out a few real pumpkins. Deep in my hoarders bin I have faux pumpkins, tons of foliage, raffia and burlap. Along with candles that should do me. Happy Fall to all at Stone Gable. So pretty! This post has certainly stirred my imagination. I love the subtle introductions of spicy tones, mixed with the classic shapes of fall pumpkins which are an, unexpected, shade of pure white. I’m with you on the “use what I have”, after purchasing a few new items only to return them a week later. Beautifully simple, and I love the coral pillow shams. I don’t care for Halloween decor personally (although Frontgate, PB and other retailers sure do make it tempting), so this pleases my eye for fall decor. It will easily carry you right to Christmas decor.